Large and decorated Pre-Columbian carved harpoon, Mayan Empire! Rare bone carving of a Harpoon carved out of a rib from a larger animal, Pre-Columbian Mexico, Mayan Culture, ca. 300-650 AD. Superb quality Pre-Columbian Inca Stone Amulet of a Llama! A very beautiful and rare Pre-Columbian Inca carved stone amulet in the Canopashape from ancient Peru, circa 1400 A.D. - 1532 A.D.
Rare bone carving of a figure with his hand together in front of him as in a prayer and a fervolent or divine expression, wearing a hat or headdress, Pre-Columbian Mexico, Mayan Culture, ca. 300-650 AD. The carving with a terrific glossy hard, darker patina, very nicely carved and polished for the perio. Condition: Choice, almost completely preserved even with outlined feet below. 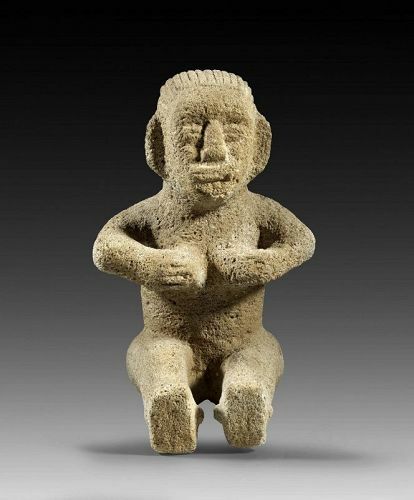 Rare Pre-Columbian Volcanic stone figure of a seated lady, cupping her breasts, Atlantic Watershed Region, Chiriqui-Diquis, ca. 300-800 AD. Seated naked woman, cupping each breast in her hands, with serene facial features, large ears to the side, the striated coiffure extending down the neck. Porous basalt, intact. The breast holding posture of this female figure is seen as a symbolic fertility gesture. A fine stylized amulet with two holes for attaching it, carved in green-greyish stone type, perhaps calcified. Ex Helene Ferro, German Collection, before 1968. Excellent rare Tairona pottery figure of female Deity w Reptiles! Pre-Columbian, Colombia, Tairona region, ca. 1000 to 1550 AD. An interesting Female Deity pottery figurine with three Reptiles;: She holds a turtle on her belly, a large lizard on her back and around them below, a thick Pyton Snake. Grey clay. Condition: Choice, absolutely fine and beautiful. Unrepaired. Ex. Old Danish Private Collection, aquired before 1967. Very rare Pre-Columbian Peru pottery vessel, Ica / Inca Culture! Extremely rare Pre-Columbian Peru pottery 'Paccha' vessel, Ica / Inca Culture, ca. 1000-1470 AD. This piece likely an imperial period vessel, dating to ca. 1300s. An expressive pottery figurine of a mother goddess; intact. Moche, ca. 300-400 AD. The figure standing facing holding her hands together in front of her, with headdress and earrings, in fine red glaced pottery. Condition: Choice, a few minor chips. A fine pair of pottery figurines, Early Chancay, ca. 900 AD-1200 AD. Both figures are attractive and in a fine good condition for the age. Lot of 4 matching Pre-Columbian Chancay textiles - w animals! Pre-Columbian Northern Peru, Chimu / Chancay culture, ca 1000 to 1300 AD. Wonderful collection of matching larger tapestry woven Sash fragments, three with Birds and one with two female figures. Very vivid colours and a set of beautiful textiles. Size: Between 17-23 cm. long. Condition: Choice, nicely preserved colours. Exceptional intact Pre-Columbian Chancay textile bag, 1000 AD! Pre-Columbian Northern Peru, Chimu / Chancay culture, ca 1000 to 1200 AD. A fine Tapestry-woven textile bag with two female figures, one on each side in different vivid colours. A very beautiful piece. Size: Ca. 13,5 x 12 cm. cm. Condition: Superb for the rare type. Interesting lot of Rodents with stylized eyes and long tails, very cute set! The head of a large burial doll, tapestry-woven with dramatic facial features and a relief wowen nose, complete and as made with the original reed stuffing! Pay of Dolls made of Pre-columbian Chancay Textiles, 10th.-14th. cent. A fine pair of old Chancay Dolls, made in the 1950s using excarvated textiles as clothing, the textiles all dates 1000-1400 AD. Cute pair that would be a great addition to any serious collection of Pre-Columbian Textiles. Size: 15 cm and 13 cm tall respectively. Amazing Pre-Columbian Colima ceramic figure of Dancing Dogs! A charming ceramic figure of a pair of upright dancing dogs, Pre-columbina Colima, Protoclassic period, circa 100 B.C.- A.D. 250. The complete face of a burial ‘doll’, tapestry-woven with dramatic facial features and a relief wowen nose, 1-2 cm high.